The Verilux Happylight Liberty 10k is definitely an improvement over the smaller 5k version. 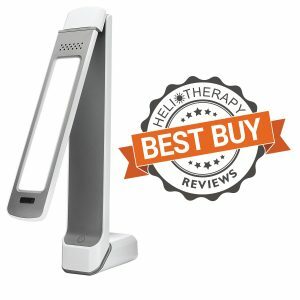 Overall, this is an effective lamp with many, many positive reviews. 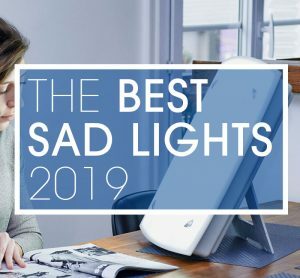 This lamp provides good quality for the price and seems to be the favorite for this price point. It has two separate light filters that you can change out at will, which makes it unique and highly customizable. There are some issues that the unit faces and some drawbacks to getting this lamp versus a similarly-priced one. Safe, full spectrum light therapy in a practical, compact size. 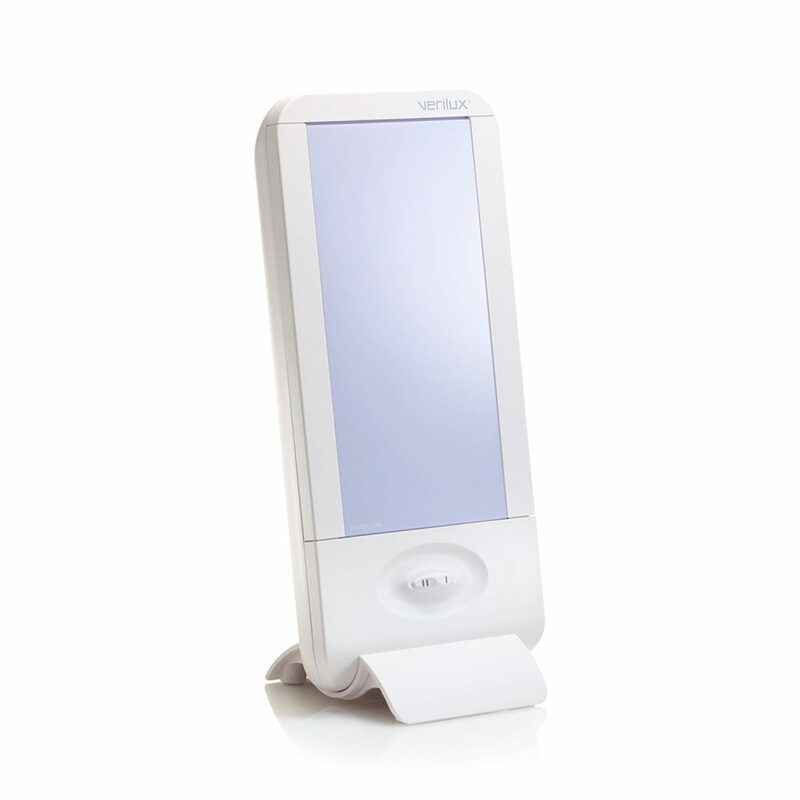 Provides 10,000 Lux, UV blocked bright white light therapy recommended by professionals. Customizes to your personal preference for light intensity with high or low settings, includes two easy to install no glare lenses for high energy or comfort. Broad surface area emits more light per square inch for efficient light therapy sessions. Light therapy at the right time of day can help improve your mood and reset your circadian rhythm to improve sleep. 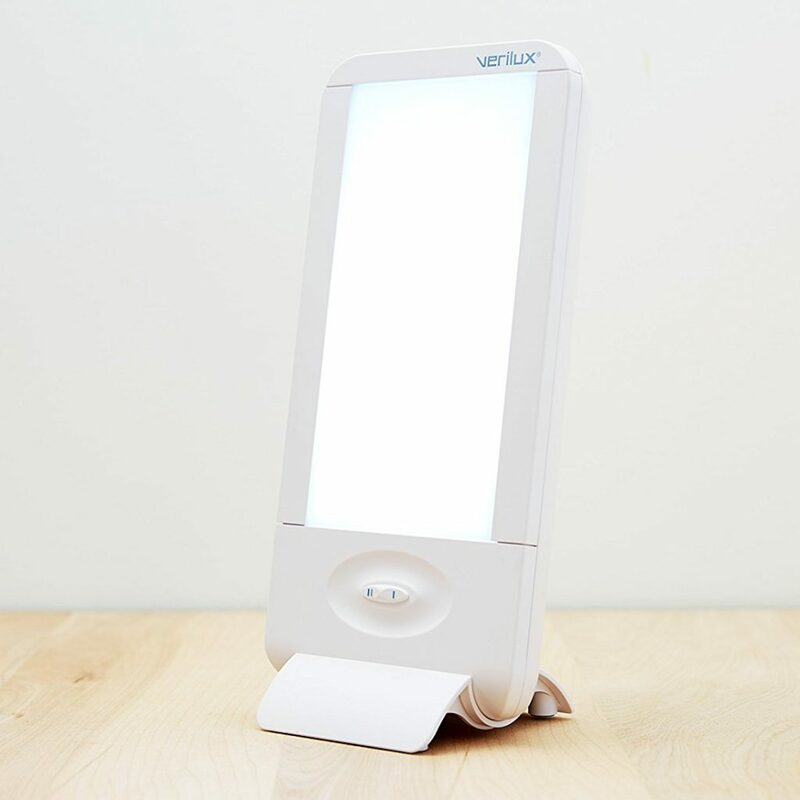 Verilux, Inc was founded in 1956 and specializes in therapy lights for seasonal affective disorder. They have numerous options on the market and aim to provide lights that are good for the Earth as well as victims of seasonal affective disorder. 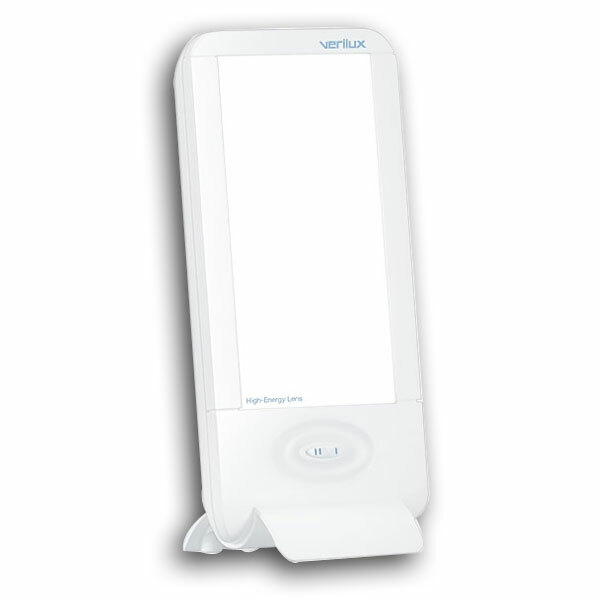 The Happylight 10k is taller than the smaller 5k model and provides a front-centered sliding switch. There are two different brightness settings and two different diffusing panels that are easy to snap on and off the unit. The base is rounded and sits in a sort of cradle supported by two feet. It is slightly unstable but not bulky or heavy. 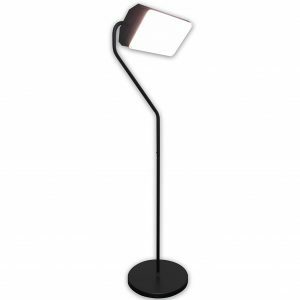 The lamp measures 6.25 inches wide, 2 inches thick and 13 inches tall, including the 10-inch lightface. The design is a soft white plastic – it doesn’t look clinical but it’s a fairly straightforward design all the same. 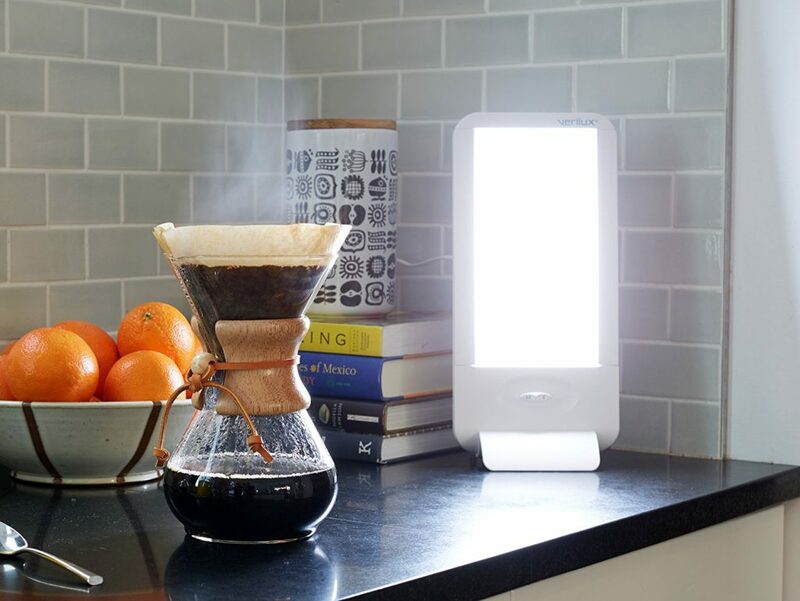 This lamp is very well packaged and simple to set up and use. The manual provides good instructions. Verilux recommends sitting 10 inches from the light to get the full effect. This lamp only needs to be plugged in to be used. The power switch is a sliding button located on the front with two brightness settings. To change between the two lenses, you only need to unsnap the existing lens and snap the other one on. This is also how you change the bulb. The Verilight Happylight Liberty 10k lux is much larger than the 5k lux version and comes with some much-needed quality upgrades. It puts out he promised 10k Lux at approximately 8 inches, which means that the light has to be rather close to your face to put out the promised intensity. Sitting any further from the light will mean you will need longer sessions to produce the same effect. The unit is made of two pieces, with a curved base that snaps into a cradle with two supporting feet. Despite this, it doesn’t seem very well balanced and is a bit unstable. The base is only 6 inches wide so it doesn’t balance well at times. However, the lamp is lightweight and does not seem bulky. This lamp is extremely popular and has a good reputation for a reason. Despite some minor complaints in design and function, the light is effective and puts out the promised full-spectrum 5500k light temperature. The face of the light is a full ten inches, which is a nicely-sized surface area for the size of the light. Unfortunately, it seems that the bulbs can sometimes be faulty. Customer service immediately contacted me upon ordering with a disclaimer that the bulb might be broken in transit. They offer a replacement at no extra charge if this happens. There also seems to be a phenomenon where the bulb is faulty and ceases to function. Verilux also offers free replacement if this happens. This lamp comes with two separate diffusing panels that are easily installed. The first ‘lens’ gives off a pinkish light and does not provide 10k Lux. The high energy lens is definitely harsher and does deliver the promised lux. It’s very nice to have two different filters as well as two brightness settings. It makes this light highly customizable depending on your preferences. The bulb for the Happylight is fluorescent rather than LED, which means that at some point it will need a replacement bulb. Verilux does sell these bulbs, but they cost $25 plus shipping, which is definitely something to consider when purchasing this lamp. However, the lamp itself is effective, works well, and blocks 100% of unwanted UV rays. Verilux has excellent customer service so any issues will be addressed quickly and to the customer’s satisfaction. The tilt of the light face is adjustable and the brightness settings are easy to identify. It’s worth noting that you have to brace the lamp in order to change the brightness setting, as the switch slides instead of changing with an actual button. This is a minor inconvenience unless you have the lamp in a strange place. The lamp is also wall-mountable.